Pit bulls might very well be the most misunderstood dogs in the K-9 family. The dogs are often associated as a violent breed because they were use in underground dog fighting rings for many years. While the ‘blood sport’ is illegal there are still some individuals who will inflict harm upon the dogs, forcing them into the cruel life, most times for monetary gain. “Free the Pitties is a project right now as we hope to become a formal non profit in the next couple of months,” Guthaim, a medically retired Marine Corps Veteran said. The couple began their work in November 2016. 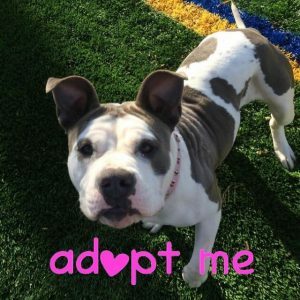 “We post pictures of homeless pit bulls located in northern New Jersey shelters that are desperately seeking loving people to give them their much deserved/needed forever home. We truly believe that there is a special place for every dog out there. We just spread the word and hope it travels to that one person or family that will take them home,” he added. “The best way to help is to adopt a dog we post. However we do understand that not everyone can so another way people can help is by sharing our pages (Instagram, Facebook and Twitter). Also by sharing individual posts of each dog and/or tagging people that might be searching for a dog. Our ultimate goal is to get these dogs to great homes and to raise awareness for pit bulls,” Guthaim said. What made you get involved in this? “Our genuine love for dogs and specifically pit bulls. We currently have three of our own. We would love to take all these dogs home with us but that’s not exactly realistic. “If you walk through any shelter, the majority of the population will sadly be pit bulls of all ages sizes and colors. Since we can’t personally save them all we decided to dedicate some time aside to bring more awareness to this most misunderstood breed. “These dogs are abandoned, misused and mistreated. Our hope is to show the loving side of pit bulls and put an end to the unfair stereotype placed upon them. Pit bulls can be the most loving and loyal dogs on the planet. 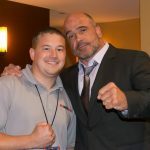 Free The Pitties is an official sponsor of MyMMANews.com – Thank you for your support.